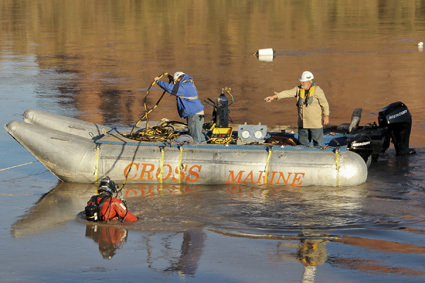 Commercial diver prepares to examine an underwater portion of pipe, while other Cross Marine Projects crew members operate the dive support systems and dive boat on a high volume river in Utah, November 9, 2011. 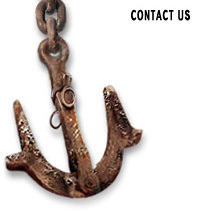 An old underwater pipeline is to be removed from the Colorado River to prevent environmental degredation of the area. Jim Cross and his crew survey the pipeline preparatory to removing it. Much of the pipeline is currently buried under tons of silt which will require special techniques that Cross Marine Projects has used successfully under similar fast moving water conditions. Jim’s technique will cause the sediment to release the pipe without the use of heavey excavation equipment that would not be able to cope with strong currents and site conditions. Once released from the sediment, the entire section of pipeline will be removed from the river preventing potential environmental issues.